Construction work is one of the most dangerous professions. Every day, a new story about on-site accidents, explosions, natural hazards, and trapped laborers conveys the life-threatening reality of construction sites. This has taken a toll on the construction sector on a broad scale as construction workers are finding it less appealing to work on construction sites. So, does this imply that the construction industry will come to an abrupt halt? Absolutely not! 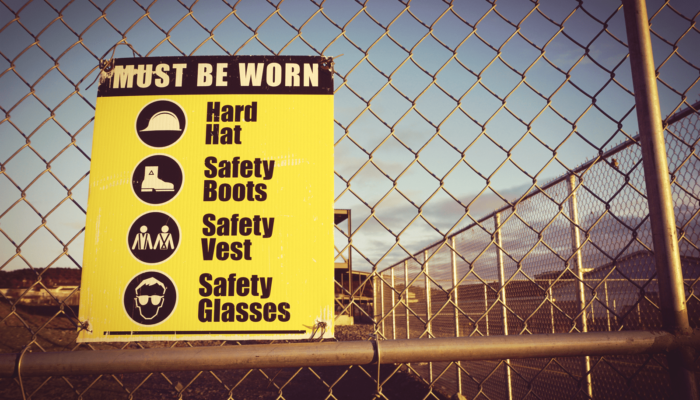 If taken proper care and precautions to mitigate potential risks, employers as well as employees can ensure a less dangerous working environment on construction sites. Palmer Heavy Equipment fortify a safe workplace for its workers by employing these 6 easy yet mandatory safety practices that helps us wrap up our heavy civil projects uneventfully and successfully. Construction workers are already skilled in their work but one thing all of them should possess before entering the construction site is the safety skill set. Several organizations offer different resources to train employees for security measures. How can it help you? Well, as a contractor, you should share pamphlets, show training videos, and organize workshops to help your workers understand and learn safety better. Experienced employees should update their safety knowledge as per the upcoming equipment and also train the fresh workers. It is important to know that communicating while working on a construction site is extremely hard with all the noise going around. Eventually, this has turned out to be menacing for both workers and business owners. Why don’t touch the technology for a better linking? Initiating communication through devices like phones or headsets will not only cut down the accident rate but also increase the business efficiency. Few legal hoops and you can dig a grave for your construction company in few moments. Never jump over important legal licenses before beginning a building. Get all legal registrations and go for licensed personnels for performing dangerous tasks, like blasting. If you are going for a cheaper option without the license, you might be putting numerous lives at stake. This part prevents accidents from improper training. Moreover, doing everything legally ensures the legitimacy of your construction project. Handing over improper gear to a worker is an invitation to a hazardous situation. First thing’s first- each piece of the equipment should be ideally working and available right at the hands. And the second thing- keep all of them well maintained. There can be equipment included for employees in the construction site that don’t directly donate to the work. Construction companies should always keep plenty of water for the workers to avoid dehydration issues. Maybe construction workers will understand every safety precaution and will eliminate all the accidental possibilities, but no one is perfect. Mistakes can happen and a supervisor can correct them. Their job should be setting a standard for safety without any exceptions. These supervisors should keep eye on every employee throughout the day and correct those who don’t commit to ideal safety procedures. Workers adhering safe practices while working and attending all meetings for safety precautions should get rewards. Those who don’t follow the safety measure should get punishments. Be careful not to give punishments through deducting salaries as this may lead to a plain aversion to work for you. Copyright © 2018 Palmer Heavy Equipment. All Rights Reserved.